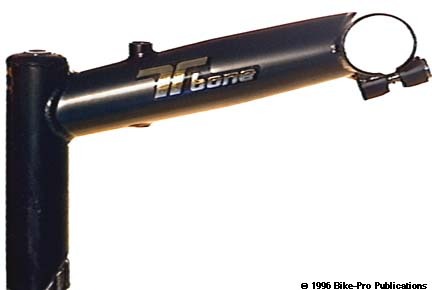 Tioga T-Bone advertising material in the recent past has said a number of things, and used photographs that don't reflect what the T-Bone stem is at the moment. These things we will clarify for you. 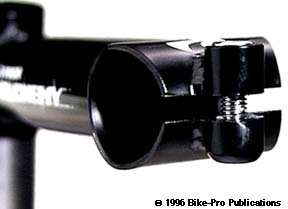 Truly, the T-Bone was one of the most popular aftermarket Cro-moly tubular stems ever made for mountain bikes. Tioga, in ads, has said that the T-Bone is made of Tange Prestige Cro-moly tubing, that may be true if you are able to find a T-Bone that has been made in Japan. 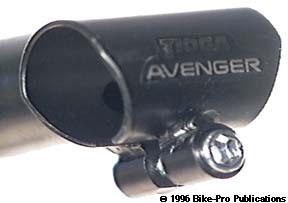 You must understand that Tioga is a marketing company that originates ideas and commissions factories to make them, or finds a bicycle item made by a factory and does world-wide marketing of the item under their "Tioga" brand name. Tioga's U.S. office is in Southern California, the most well known of the owners in Tioga, (or more likely the only owner), is "Rio" Marui, a Japanese national. Marui Ltd. of Osaka, Japan is also owned by Mr. Marui and was, for many years, the sole export/trading company for Shimano bicycle products to the U.S. Sometime in 1989, T-Bone stem packaging changed from a plastic windowed box, to a plastic envelope with a stapled header card. Up to that time, the T-Bone stem had been made in Japan. With this new package it was discovered that the T-Bone was now made in Taiwan, by Hsin Lung for Tioga. The T-Bone is made of Cro-moly steel tubing, but they no longer label the quill tube with the Prestige decal, probably because the Taiwan version isn't made with it, (even the Prestige model T-Bone used the Prestige tubing for the quill only). The steel tubing for the quill is 1.8mm thick. The Cro-moly extension is made specifically for use as a T-Bone extension. The extension tapers at the back and is miter cut to fit snugly to the quill. The binder tube, (made of 1.6mm thick steel), and the quill each have a hole drilled where they are TIG welded to the extension to relieve the heat and stress from the welding process. The binder fitting is machined from steel rod and TIG welded to the binder tube, then sawn through to create the cinch system. All the welds are extremely clean, with no extra flash, and show smooth movement of the wire feed as the weld was made. The stem at this point is painted a matte, flat Black. The cap piece that slides into the quill is made of cast steel and painted gloss Black. The expander bolt is chrome plated steel with 8mm by 1.25mm thread pitch, has a 6mm allen head, is 123mm long and weighs 44 grams. The wedge is cast steel, tapped for the expansion bolt after casting. The binder bolt is chromed steel, with a 5mm allen head, has a 6mm by 1mm thread pitch, is 20mm long and weighs 6 grams. 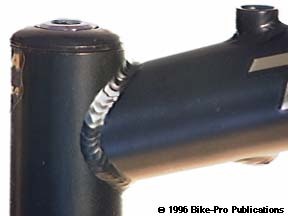 A cable hanger is used to route the brake cable using a Ritchey Split Hanger, Syncros Hang Doggy, or the Dia-Compe equivalent. The T-Bone is available only in Black and comes in either the 1" or the 1 1/8" diameter. The Top routing model is available in 90mm, 105mm, 120mm, 135mm, or 150mm extension lengths. The Internal routing model is available in 105mm, 120mm, 135mm, or 150mm lengths. The T-Bone in a 1" diameter and a 135mm length weighs 356 grams. The same stem in 1 1/8" size weighs 404 grams. The T-Bone fits handlebars that have a 25.4mm outer diameter. The Alchemy CR is in a way the Ahead version of the T-Bone. Tioga adopted for marketing the name Alchemy for all their Aheadset, (threadless) parts. Made for Tioga by Hsin Lung, (who also makes the Ritchey and Zoom steel Ahead stems, which are very similar) the vertical clamp tube has a 1.15mm wall thickness. The binder tube has a wall thickness of 1.44mm. Both the vertical and the binder tubes have holes drilled through one side which face into the extension tube at time of welding to relieve heat and strees from the welding process. 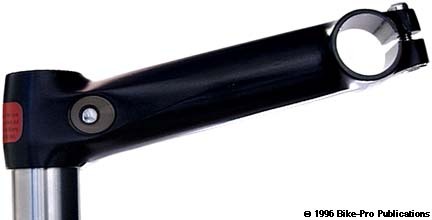 The extension tube is round at the vertical clamp tube, having a 27mm diameter. At the binder tube it is ovalized, 34.5mm wide and 29mm high. The three tubes are TIG welded together with finely pulsed welds that start on the right side for the binder weld and the bottom for the vertical tube weld. The binder fitting and the two clamp fittings are machined from steel rod employing similar techniques. Turned on a lathe to shape and cut each, they are bored and drilled through to recess the bolt head, then tapped for the theaded bolt shank. The binder fitting is welded to the front, then tube and fitting are sawn through leaving a 5mm kerf creating the cinch mechanism once the bolt is installed. The vertical clamping tube has fittings welded 10mm from each end, again the tube and fittings are sawn through leaving a 5mm kerf. The clamp bolts are installed from right to left. As mentioned the same bolt is used for all three. The 6mm x 1mm chromed steel bolt has a 20mm length, a 5mm hex fittingand weighs 6 grams. Tioga also has made them in Taiwan a light weight model for their Alchemy stem line made of aluminum. The stem though made of aluminum, lacks all the external weld beads that other aluminum show, this may be from careful polishing. The stem is said to be cold forged. The vertical clamping tube and the extension appear to be made as a single piece, and may therefore be cold forged. The vertical clamp tube has been machined post-forging to clean and make perfectly round the interior. From the side there are two holes drilled, one from each side, at an angle toward each other. In each of these, a machined aluminum piece is positioned. Each of the aluminum pieces is one half of an inner clamping system. One piece is threaded, the other allows the bolt to pass through. 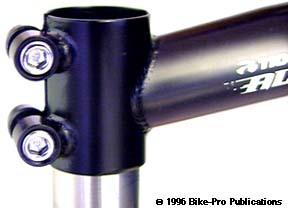 The steel bolt passes into the system from the right side, leaving the bolt head recessed into the side of the stem. The extension tube shows evidence of being bored to a depth of 90mm leaving a 25mm diameter through the extension tube. In order to drill this hole, the binder section would have to be added afterward. The evidence of this isn't complete, but it seems that it might be welded to the extension tube, because of small scratches as a part of the polishing the welds away. The binder addition gives the appearance of an extrusion turned on a lathe to cut away the excess and leave a protrusion that will become the binder fitting. The binder protrusion is drilled from both sides, the top to recess the the bolt head, the bottom accomodate a stainless steel nutsert pressed in from the bottom. 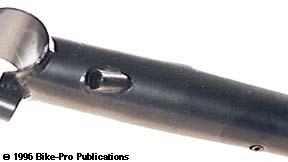 The binder bolt has 6mm x 1mm threads, is 19mm long, has a 5mm hex fitting and weighs 5.5 grams. The steel clamping bolt has 8mm x 1.25mm threads, is 28mm long, has a 5mm hex fitting and weighs 12 grams. The Alchemy Al has a 25.4mm inner binder diameter for mountain bar use. It is available only in Black, in two diameters, 1" or 1 1/8". Made in four lengths, 105mm (10 degree rise), 120mm (12 degree rise), 135mm (11 degree rise), or 150mm (10 degree rise), the weight of a 135mm long Al in the 1 1/8" is 213 grams.